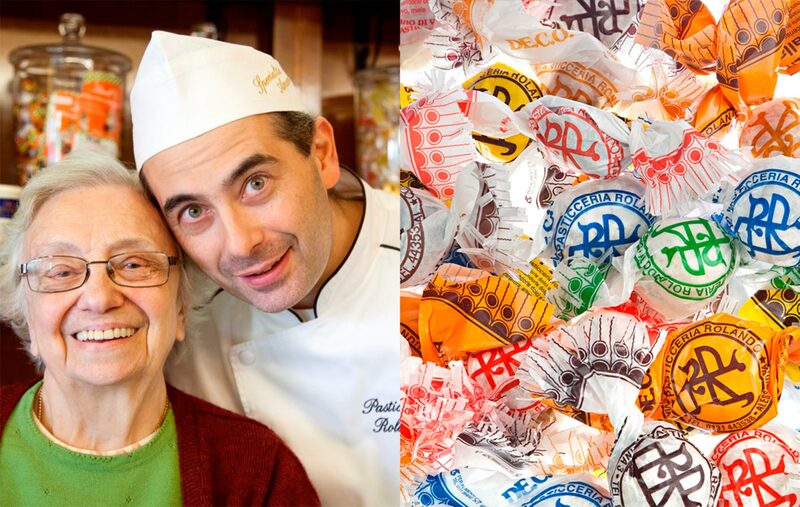 Our story begins with nonna (grandma) Teresa, born in 1931 and still standing strong behind her pastry shop counter today. She greets us, her hair styled in a jaunty cut and her fashionable sweater-cardigan something that Dries Van Noten would be proud of. But what we notice first is the joy and vitality that radiate from her, attesting to how she has loved and been loved in return. At the beginning of the Rolando amaretti history is a story of love. 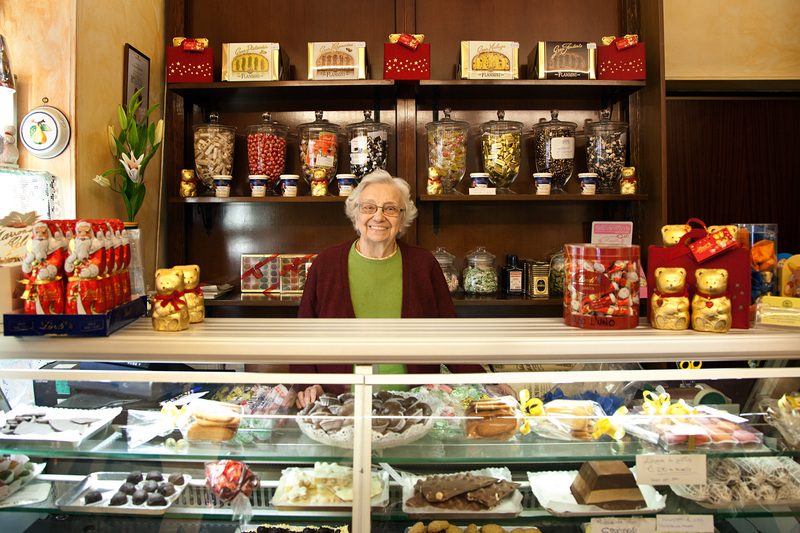 At the age of thirteen in 1944, Teresa found work as a store clerk in a pastry shop in Alessandria, Piedmont. There, she met Lorenzo, a twenty-two year old pastry chef who had just returned from the front as a prisoner of war. He kneaded dough with the stamina of the new and the perfectionist, while she wrapped and handled treats that, once opened, never failed to elicit smiles. Their work together couldn’t have been other than a recipe for success. In the flurry of seeing each other every day, they fell in love. Nonna Teresa glosses over the details, but her grandson Marco gets emotional. He has inherited his grandfather’s skill. Madga, Marco’s mother, was born is 1951 and had her son in 1975. She grew up in the pastry shop and knows how to do everything there, but knew it wasn’t her path. Perhaps, if there had been a cafè next to the pastry shop, she might have reconsidered … but no, she prefers the office life. The pastry shop remains her Sunday work when her family needs a helping hand, but nothing more. The pastry passion skipped a generation. Nonno Lorenzo’s talents passed instead to his grandson Marco, who grew up alongside his grandparents while his mother worked in the office. One day he was watching his grandfather toast hazelnuts, and the next he was inventing the caffè amaretti. He may have been just a child, and the pastry shop just his granparents’ house; he may have grown up to become a certified surveyor, but that pastry passion didn’t let him forget his roots. At the end of military service, Marco spoke with nonno Lorenzo. “I thought about it some, and I’d like to carry on the work of the pastry shop. I want to do what you do.” His grandfather was touched, and twenty years later, we are also moved, listening to his story. The photographer had to wait a moment before everyone composed themselves, but he had tears in his eyes, too. Maybe you feel a part of what we felt that day, because sharing somebody’s passion means sharing these poignant emotions and memories. We recognized the goodness in all those types of amaretti cookies – impossible to decide which we liked best – and in the joyfulness of Marco’s daughter Sara. Just six years old today, in the not-distant future she’ll be the custodian of recipes that will make customers smile. In the boxed set of Rolando amaretti, there is much happiness. It’s there with nonna Teresa, who knows that her and her beloved husband’s creation will continue to live on; there with Marco, proud to pick up the reins of his grandparents’ heritage; and with us, when we look upon little Sara and her blue eyes with their deep, direct gaze. She already portrays the same joy in helping her papà make the delicious amaretti her great-grandparents did.